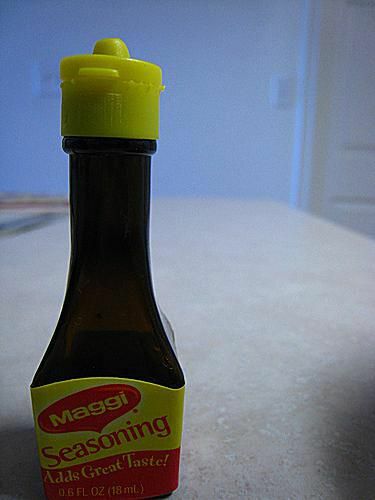 Maggi seasoning is a food flavor enhancer, invented in Switzerland and introduced in Germany that comes in a thin, concentrated dark brown liquid, powder, and cube form. In Germany, it's called Maggi Würze. "Wurze" means spice or seasoning. It smells and tastes like lovage, an herb that has the flavors of celery, parsley, and fennel rolled into one. It is unclear if lovage is one of the herbs in the "secret" recipe, but Germans seem to think so. Since the sauce was invented, the Germans colloquially call lovage "maggikraut," and the Dutch call it "maggiplant." Maggi is a product that is used all over the world. In Africa and in the Middle East, it is used mainly in its cube form. There are a total of nine different formulations, which differ among nations and regions. The Swiss version is the original flavor, but some will argue that the French version is better. Mexican Maggi is called Jugo Maggi, and it comes in mild and spicy, and, there is a version with lime. The one known in the Philippines has more garlic in it, and the Polish version is lighter in color and a bit more sour than the original. So while it's used around the world, Maggi can taste slightly different from country to country, depending on the local preference. Some claim it tastes like soy sauce and Worcestershire sauce mixed together. While Maggi Würze is a salty sauce typically used in cooking, sometimes it can be found as a condiment on the tables of restaurants and home cooks. If you're not familiar with it, you should use Maggi sparingly, as you would soy sauce. Similar to soy sauce, but based on wheat protein, it is high in sodium and is a bit of an acquired taste. Julius Maggi, a miller from Switzerland, created and marketed the first instant pea-and-bean soups in the late 1800s to serve the need for nutritious, vegetable-based foods for the working class. His first factory was in Singen, Germany, which was established in 1887. In 1886, the Maggi company came out with a Maggi liquid seasoning, a dark-colored, vegetable protein-based sauce. Hydrolyzed vegetable protein is high in MSG, which is known to improve the taste of savory foods. It was found to be an inexpensive substitute for a meat extract, like a broth or stock. The liquid comes in a dark brown bottle with a yellow label. The cap color differs from country to country. It is red in Switzerland, Germany, Canada, and France. The cap is yellow in China, the Netherlands, and the U.S. Asia has eclipsed Europe in its use of Maggi, including even Germany and Switzerland. German Frikadellen: This recipe for pan-fried meat patties or little hamburgers is often made with moistened bread, bacon, herbs, caraway, marjoram, sometimes chopped pickles, and Maggi. Polish Sausage-Potato Casserole: In most Slavic countries Vegeta is used instead of Maggi, but in this American-inspired recipe, Vegeta and Maggi can be used interchangeably.